New life is gloriously appearing everywhere and suddenly I cannot concentrate on our studies. It's supposed to be the kids who have the problem, but right now it's me. I just want to lounge around and do nothing structured, for about 24 hours and then I will want our routine back. "But though it may seem sad, one grows out of Tudor cottages. Little by little, the charm of being stunned and sent reeling to the wall, six times a day, by the low beams on the ceiling, is apt to pall; one no longer darts gaily up to the bathroom for the sticking plaster, chortling with amusement at the nice Tudore bumpe on one's forehead. Nor, as season gives way to season, and as the bedroom florr sinks more sharply, tilting at an even acuter angle, does one take so much pleasure in emerging from bed, as it were, on skis, and sliding down a highly polished slope towards a lattice window through which the dawn comes but faintly. It would be pleasant, one feels, to be able to stand up straight, from time to time; it would be even pleasanter to be able to read a book without crouching in a draught under the aforesaid lattice. As it is with comfort, so it is with taste; to linger in the Tudors is merely a sign of aesthetic adolescence; one must move on to the eighteenth century, and if one has any sense, stay there. There comes a time, or there should come a time, in the life of every civilized man, when he realzes that the eighteenth century said the last word worth saying in absolutely everything connected with the domestic arts. Sometimes this realization comes by chance; he may be standing in a Georgian doorway, and the sun may shine on it, and he may look up and suddenly perceive that he is standing in a frame that is as perfect as a melody made by Mozart. Sometimes it comes painfully, by long study. In my case it came when I inherited four William and Mary chairs of the school of Daniel Marot. Those chairs altered my life. By their elegance, their assurance, their chastity, they were a silent reproof to everything in their vicinity, including myself. 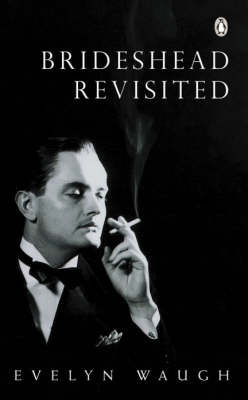 I was not sufficiently elegant; I was not sufficiently assured; and we will skip the rest. But those chairs did me persuade at least to try." So there. We can romanticize life in a quaint Tudor home, but reality sinks in every time the low beams make their point. Two years ago, I read the second book in this trilogy, Laughter on the Stairs, (without knowing it was a sequel) as my first introduction to Beverley Nichols and his writing. He paints such clear scenes with his words, even if there is only a sliver of truth to it. Heidi at Mt. Hope Chronicles recently shared quotes from Merry Hall which reminded me to go back and read the trilogy in the right order this time. When you want to learn something that seems mostly impossible and at best, barely attainable, it is quite easy to be discouraged at every turn if you know where to look. And I know where to look. Sometime after I became a mom I realized that I wanted to know how to draw and help my kids know how to draw. I bought a book and tried my hand for several weeks and then another hobby, interest or baby took my attention away from my goals and my efforts. I kept my notebooks and supplies close at hand, which succeeded in both making it easy to keep trying and also in mocking me as they stood there panhandling for dust. But I also began to work to turn my discouragement over my lack of ability into inspiration by creating spaces where I could keep track of drawings and illustrations that inspired and delighted me. I came to understand that artistic talent can be learned, and that while many wonderful artists, illustrators, and doodlers are born with a natural ability that wows and cheers us, there are many aspects of drawing, painting and lettering that can develop from genuine practice and perseverance. And so I putter. I follow directions. I study images. I notice how the mind can be tricked into seeing complex shapes by simple lines and shadows. I give myself time to practice, to play, and definitely to scowl and frown at my work. My children wander by and stand over my work and ask, "Did you draw that, Mommy?". Yes, for better or for worse, I did. They are always impressed and sometimes I feel quite embarrassed by their accolades because it's not very good work. But then again, that's the wonder of children that we seek to keep alive and nurture. Build walls around their wonder to protect it is how Dr. Christopher Perrin phrased it in his talk last year on Chesterton. To look at those letters that form April and see my first attempt to letter with a paint brush is a bit astounding. My cursive handwriting is not very pretty so I quailed at the thought of trying it with a paint brush, but the brush bent in such a way, I simply followed it's graceful swoop. And then before I knew it, I had made it to the end and I simply exhaled, slightly giddy over the attempt. How could I have made that? I still wonder, but I know it was the delicate brush that made it possible. So let me encourage you to persevere in your noble goals and dreams. I consider myself to be the least likely to draw or paint anything(trust me) and if I can produce anything even remotely recognizable, surely you can too in whatever area seems impossible to you right now, whether it be in music, fine art, handwork or under-water basket weaving. Sorry, old high school joke. And when you find yourself making a fern stem that looks more like a walking stick, you can always mix up some browns and turn it into a log, bursting into bloom. Perhaps it will look nothing like any species found in your guide book, but surely Tolkien's Middle Earth had at least one growing next to a giant walking tree. And then perhaps everyone in the shire will want one. Sunday morning. Kate only wanted to hug and squeeze Laura and not look at the camera. She also was done taking photos. So Laura took the spotlight for the last four seconds. Gotta get 'em while you can. April has been full of life, New life outside and creative life inside. We are delighting in the new season of spring although winter seems to want us to remember it by sending some brief snowflakes this week. It is so enjoyable to run through the grass and carpets of moss knowing that we have many wonderful days ahead of us to watch everything break into bloom, despite some truly chilly days which drove us back inside. The mosquitoes appear to still be drugged with winter hibernation, but we certainly don't regret their tardiness. The male cardinal likes to sit in the very highest of high branches of the locust tree in our front yard and sing his heart out. The female noiselessly alighted on our back fence for seconds before taking flight again. I don't know the status of their relationship, perhaps it's complicated. I appear to have unjinxed myself from the curse of messing up hard-boiled eggs. I have been using, as one friend jokingly called it after she heard the process, the hard-steaming method which I first heard about from Heather Bruggmann of Beauty Moves. Instead of bringing the water to a boil and then adding the eggs, I have been adding the eggs to cold water, bringing it all to a boil and the reducing the heat to a bare simmer and setting the timer for about 13 minutes. After cooking time is complete, I dump out the hot water and pour cold running water over the eggs for about 30 seconds that put them right into the fridge to chill as usual. When it comes time to peel, I run cool water over the egg as I peel the shell into a small bowl and compost. I've followed this process twice in the last week and had identical success so I consider it a victory and am contemplating a summer of deviled eggs for every potluck. After saving toilet paper rolls for weeks, I finally gathered them up and got out the paints and had a paint party with the kids. They were done after about one or two rolls so I happily took over the paints and mixed and slopped to my heart's content. I was setting about to make houses for Laura's peg people, new and old ones, wandering animals and others in need of shelter. The idea came from a image seen on Pinterest, which when I finally tracked down the source came from a cute blog in Hungarian. A few minutes with Google translate and after a few rough starts, mass production began and we now have a small village of homes which are awaiting some newly refurbished peg people. One resident down, 41 to go. I was inspired by Margaret Bloom's book Making Peg Dolls which I saw on Remedial Eating, (another wonderful blog)and Margaret Bloom's own blog We Bloom Here. So did Roger Deakin: 'Why would anyone want to go to live abroad when they can live in several countries at once just by being in England?' he wondered in his journal. Likewise, Henry David Thoreau: 'An absolutely new prospect is a great happiness, and I can still get this any afternoon. Two or three hours' walking will carry me to as strange a country as I expect ever to see. A single farmhouse which I had not seen before is sometimes as good as the dominions of the King of Dahomey.'" I always thought something was disturbing when some disinterested party rained on another person's excitement over a nature-spotting of any kind. And even more so if the disinterested person was a professing Christian who would sing Isaac Watt's hymn, I Sing The Mighty Power of God, or Maltbie Babcock's This Is My Father's World on a Sunday and be apathetic by Monday. But then I read Anthony Esolen's words a couple of years ago. We might think an ordinary flower is just that; but to the mind made attentive to the works of nature, the most ordinary things are steeped in their own peculiar ways of being, and are mysterious. Two paragraphs later he lampoons commonly held views on nature. Now I understand that it is an undernourished soul, a dead imagination that has no time or concern for what is noticed by others around them. It is the 'cool aloofness' begun as early as elementary school, but certainly well in place by middle school that slams the door on a fascination with the already known, the already named, the already seen. And yes, I am generalizing. I could go out everyday and stare at the river flowing outside our home and never grow tired of it. I would post a photo everyday, but if you can't see it in person, the photos would probably seem alike by day four no matter which angle I tried to capture. But we all have something in our neighborhood that deserves our time and attention to study it, to know it, to enjoy it in various weathers and seasons. three geese disturbed by my early morning visit to their river. "Meanwhile, since you come to us as friends, favour us by celebrating this annual festival, which it is wrong to delay, and become accustomed to your friends' table." I read those words a few weeks ago as I continue to work my way through the class from Old Western Culture and Roman Roads Media on The Aeneid and I immediately thought that it defined hospitality so well. The desire for your friends to be accustomed to being at your table. I need some work in this area and who would have thought that I would find some encouragement in The Aeneid. Wonders never cease. What happens when a seal loves your city, your sidewalks and your streets? You make a seal crossing sign and let her be. 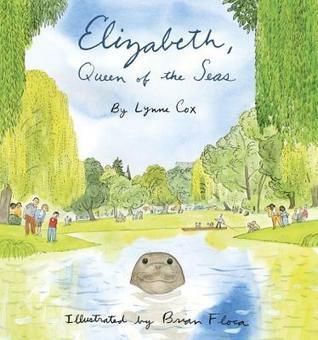 This is a true story of a seal in Christchurch, NZ who was determined to make her home in the city. 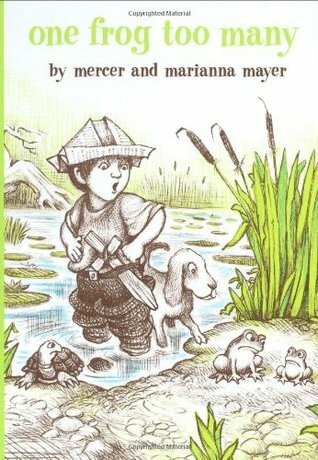 My animal-loving five year old enjoyed this story and the illustrations are cute. While readers may want words to tell them the story, this one relies on expressive frog eyes. And it works. 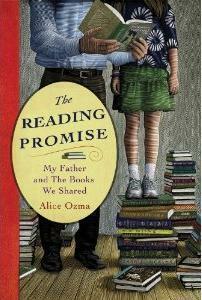 We liked this fun, little wordless book. 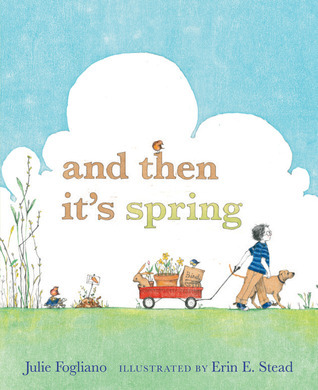 This is not your typical spring book; it features more brown than green, but it tells the story that most seed-planting gardeners will recognize. The planting, the watering, the waiting, oh the waiting. The illustrations are fun, simply drawn, and uncrowded. 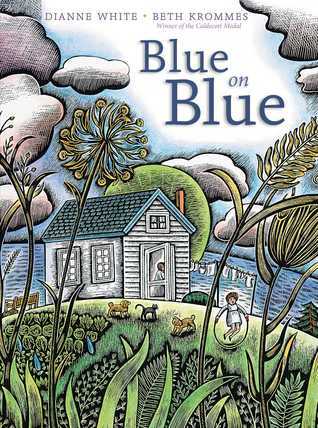 Written as a poem, the illustrations and the words carry you through a stormy day and night at a little girl's farm home. It was refreshingly different. 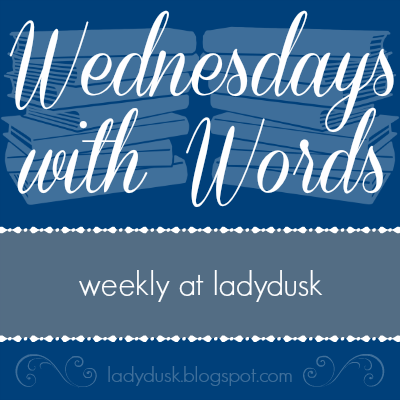 It's probably not a good idea to start a series with the third book, but I did anyway. I thought I would pre-read this before handing it to my eleven year old son. I'm glad I did. I think he read the first one several months ago and when he brought it back to my room along with a few other other books, I asked him what he thought. He just shrugged and didn't really have much to say except that he didn't really like it. He preferred his Unfortunate Events series. I preferred The Melendy Quartet series myself. I know this series has received rave reviews, I just didn't care for it as much as I thought I was going to at the beginning of the story. I knew I didn't like the boy-obsessed middle sister character, but it was a review on Goodreads that reminded of that popular theme in many modern books for older children, angst. I prefer less angst in my books, I think I get enough in real life. I am listing these two titles here although they have been read over the span of two years as read alouds in our Morning Time. 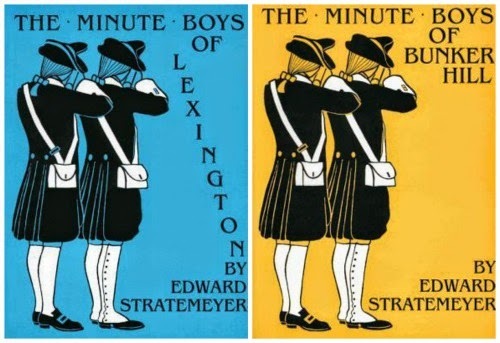 The first book, The Minute Boys of Lexington introduces us to the various characters and families who see the first moments of the American Revolution. The second book, The Minute Boys of Bunker Hill follows the story as the war spreads to Boston. 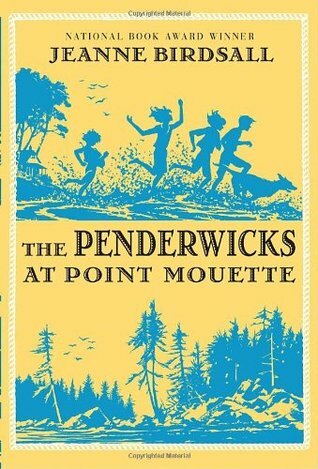 Seth, my eleven year old, loved these books and hated it when Mr. Stratemeyer employed the terrible chapter-ending cliff-hanger. The main character, a teenaged Roger Morse shows character and courage beyond his years in both caring for his family and his country. I truly enjoyed the four essays in this book, even if Milne managed to remind us how much he considers Adam and Eve and the Garden of Eden a fable. And for that reason, I decided to skip the story at the end of the essays about Adam and Eve. I knew I wouldn't enjoy it and I didn't want to spoil my enjoyment of the rest of the book. I have quoted from the book previously both here and here and would love to read it again. This was the third book I read by Milne, having also read two of his memoirs earlier this year. I really thought this would be about the books they read together and the conversations they had about those books. It is not. It is a memoir with various chapters on different snippets of her life with her family, her father in particular who appears to be a truly dedicated children's librarian and story-teller. But the amount of dialogue she recounts in every single chapter makes you wonder exactly how much she is remembering versus manufacturing. I made myself finish it, but could not recommend it with any enthusiasm. I did it! I finished this book. I started this two years ago and kept putting it down but as I recently shared, I found a way to help me get through the huh? parts until I could genuinely follow the story on my own. I listened to Jeremy Iron read parts of it and then I returned to the book and finished it on my own. I even managed to see the ending coming which I was rather pleased to know since it was taking so long for me to figure out this book. Here is interesting discussion between Charles Ryder and Cordelia Marchmain. "'I never really knew your Mother', I said. 'Well, you see, she was saintly but she wasn't a saint. No one could really hate a saint, could they. 'Oh, I'm quite serious. I've thought about it a lot. It seems to explain poor mummy."